Greg Bryan of the Arizona Daily Sun and Jim Labelle, president of International Insurance Group, Inc., are surrounded by Labelle's staff in their office Friday. The company has nearly tripled its size in three years and claims to provide more insurance to U.S. vehicles crossing the border than any other company in the country. Also pictured are - 2nd row, L-R, Ashley Monteverde, Christine Mayer, George Howington, 3rd row, L-R, Nancy Hicks, Nate Watson, and Arron Shiffer. 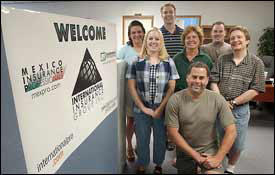 It's taken just three years for International Insurance Group, Inc. to go from a small start-up company in Flagstaff to a national insurance powerhouse, but you'd never expect it from its cozy offices on Milton Avenue. In January 2000, Jim Labelle and his wife, Andrea, moved from Phoenix to Flagstaff with an idea to provide traveler's insurance to people going to and coming from Mexico. The idea of getting such insurance isn't unique. In fact, it's necessary. But after years of working in the insurance industry and struggling to match his customers with their insurance needs, Labelle decided to make a one-stop shop for traveler's insurance right on the Internet. Now, Labelle says his company provides insurance for more U.S. licensed vehicles crossing the border than anyone else in the country. Last year, the company helped sell about 60,000 policies and he hopes to get close to 100,000 this year. His company has been featured in a number of trade publications and has grown from three people in 2000 to eight this year. If it wasn't for the Internet, Labelle said he would need 20 employees. "We are what's known as a managing general agency," Labelle said. "We're kind of in between an insurance company and an insurance agent." People driving to Mexico are strongly advised to get Mexican insurance. Domestic policies usually stop once a car crosses the border, but finding a reputable agent in Mexico can be a hassle. By clicking onto Labelle's company's Web site, customers and insurance agents can make the arrangements right away. Through his work in the industry, Labelle developed contacts with three of the largest insurance providers in Mexico and the company's contacts with insurance providers stateside, means Mexican traveling to the U.S. can log on and purchase their insurance as well. "Ninety-nine percent of what we do is online," Labelle said. "The Web site enables people to get insurance from a guaranteed classified insurance company rather than stopping on the border and looking and not being sure who they're buying from." Labelle said more than 500 licensed agents use his site to find Mexican insurance for their clients, and a number of companies, including AAA Arizona, link to his site for services. In addition to providing auto insurance for U.S. and Mexican motorists, Labelle's company also connects clients with life and health insurance policies for international travelers and consults with other insurance companies wanting to put their services online. The country's renewed focus on border security and general fears about international travel since Sept. 11, 2001, has had a curious effect on his business, Labelle said. "What's interesting is that it hasn't really affected our numbers," Labelle said. "While the overall market has probably shrunk I think the overall awareness of the need for these types of insurance has grown." He said, for example, if 100,000 people were going overseas for vacation, probably 5 percent would invest in life and health insurance. Now, that number may have been reduced by half, but close to 50 percent of those people might look into supplemental insurance. There are two factors to account for the company's growth, Labelle said. "We market ourselves like crazy," he said. "Mostly through Internet searches and a lot of it's word of mouth. But once you've had to stop at the border to buy insurance people will start looking for an easier way to find it." That brings in clients, but Labelle said the connections he's made with the Mexican insurance providers and the infrastructure of Mexican agents, adjusters, road service companies and legal aid services; makes him an attractive alternative for insurance companies looking for ways to meet the needs of their clients. "It's virtually impossible for a U.S. company to set up its own infrastructure, so we're an attractive option since we have all of those relationships," Labelle said. The types of clientele varies. In Arizona, it's mostly tourists, he said. "Gringos going to Rocky Point to relax and have a good time," he said. In California, it's a combination of tourists and business travelers who routinely cross the border to live and work. His largest market is Illinois, where a large migrant population returns home once or twice a year by car and needs Mexican insurance while they visit family. Because of the nature of his business, Flagstaff was an ideal place to set up shop, Labelle said. "We have two young kids and this is a great place to raise a family," Labelle said. "I love the climate, I love to ski and I hate the heat." He added: "We liked Flagstaff because we were doing it all online and believed we would be successful online. We felt we wouldn't be in competition with local agents selling local policies."